All of the flavors from the classic Thanksgiving side dish come together in this delicious yeast bread recipe – marshmallow, brown sugar and pecans galore! I’m not lying when I say I have literally been dreaming of this dish since Thanksgiving of last year. It came to me a bit too late in the game to make it happen for 2015, but you can bet I’ve kept it at the top of my list for Thanksgiving 2016. 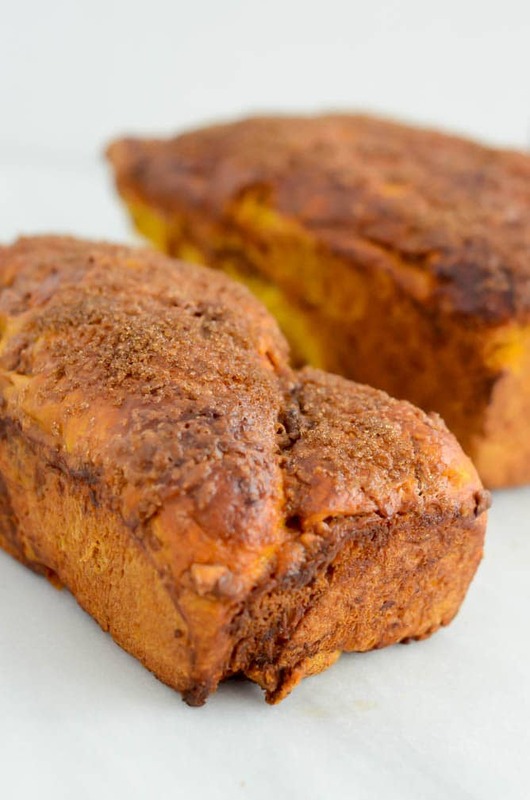 Ladies and gents, today we’re talking about sweet potato casserole – in babka form! We all know that (thanks to my dad) I’ve been experimenting a bit with different cinnamon roll flavors. I made these Pumpkin Praline Cinnamon Rolls with Bourbon Cream Cheese Frosting for the #virtualpumpkinparty last month, and I have to admit the results boosted my confidence in making goody-filled yeast breads. 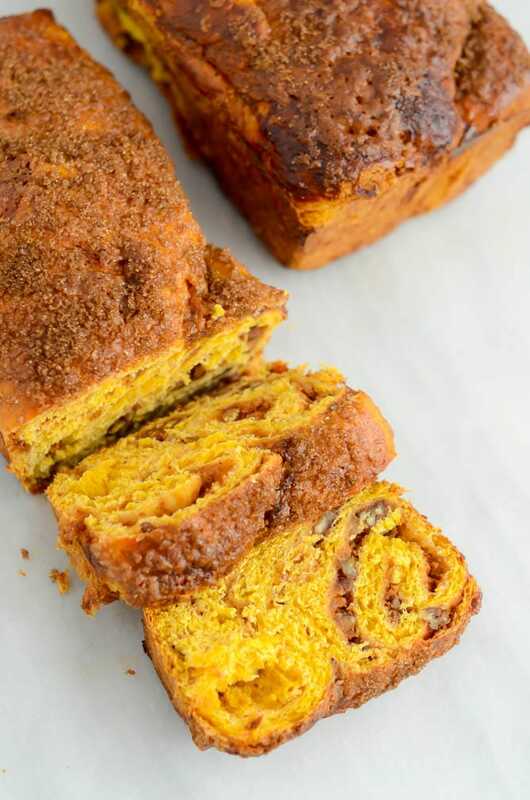 I also stumbled upon this great base recipe for Sweet Potato PIE Babka from A Brown Table. I knew it would serve as a great starting point for me, with just a few of my own twists. 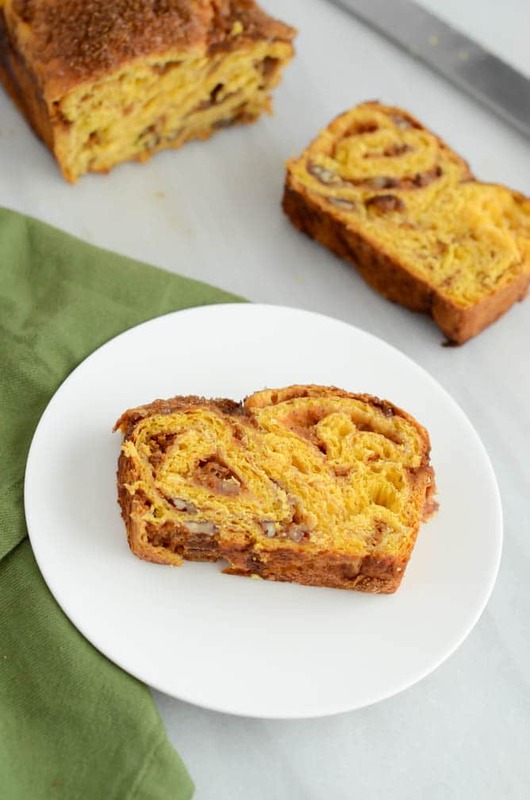 My dreams of making a Sweet Potato Casserole Babka finally seemed within reach! So let’s talk about these ingredients. They’re literally EVERYTHING you would find in the classic sweet potato casserole. 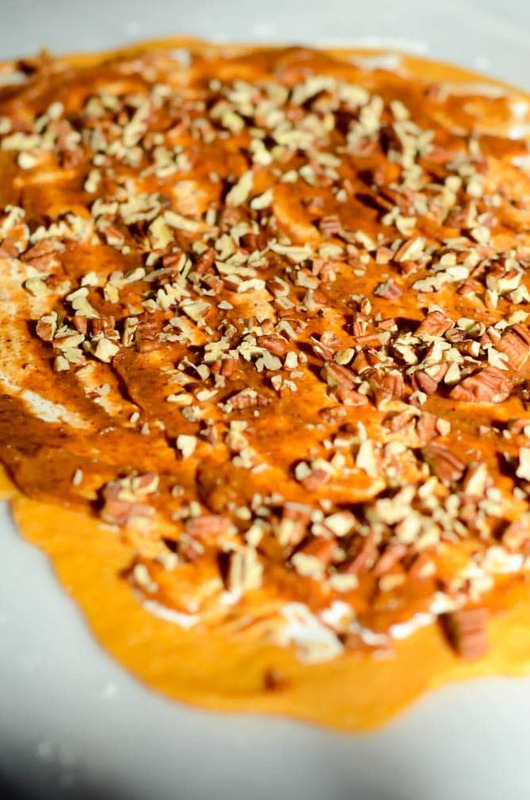 We’re talking sweet potatoes (duh), pecans, brown sugar, even marshmallow fluff. 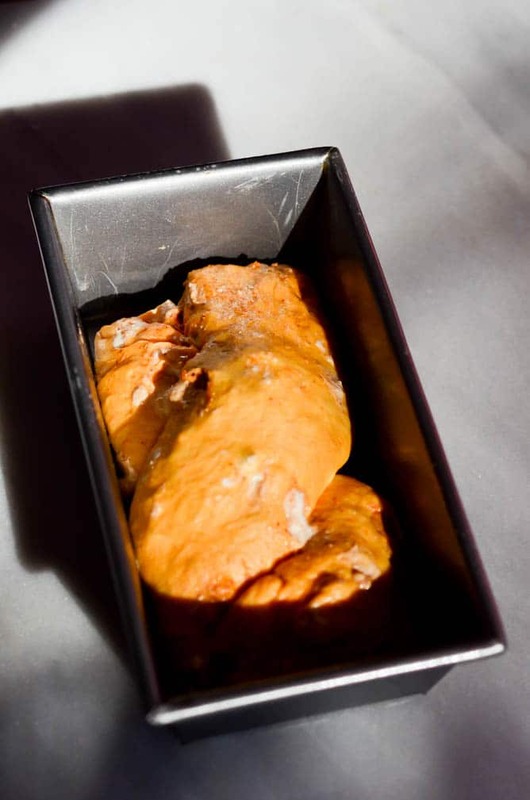 Pureed sweet potatoes are both kneaded into the dough and mixed with brown sugar and almond flour as part of the sweet, gooey, crunchy filling. The pecans and marshmallow fluff are also key players in the filling, and give the bread the perfect balance of sweet and savory. Now, I’m going to be completely upfront and honest that this Sweet Potato Casserole Babka is NOT a quick and easy recipe. It takes some time, but with careful planning you can totally do it. I believe in you! It’s also worth pointing out that I can almost 100% guarantee that your dough will not turn out perfectly – the filling in mine was oozing out of every possible seam and I was barely able to get it into the loaf pan in one piece. But have patience my friends. This recipe is very forgiving and, in some ways, the messier, the better. The more of that marshmallow fluff-brown sugar-sweet potato-pecan filling that seeps out of the sides, the more delicious, sweet, crunchiness you’ll have in every single bite of your Sweet Potato Babka Casserole. Have no fear if it gets a little messy, it will all turn out in the end. I also love that this recipe yields two loaves. The hubs and I dug right into the first loaf, and were not shy about spreading a hefty glob of Copycat Trader Joe’s Pumpkin Cream Cheese over each slice. We popped the other loaf right into the freezer, and plan on sharing it with our family over the holiday weekend. Gotta love freezer-friendly baked goods when the crazy holiday season rolls around! I’m going to keep it fairly short and sweet today. I have some packing and organizing to do in preparation for a quick little jaunt I’m taking to Napa over the next couple of days. Be sure to follow along on Instagram stories for all of our fun adventures. 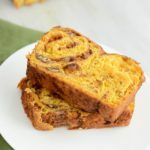 And be sure to plan to have this Sweet Potato Casserole Babka ready for breakfast, lunch or dinner over Thanksgiving weekend! All of the flavors from the classic Thanksgiving side dish come together in this delicious yeast bread recipe - marshmallow, brown sugar and pecans galore! 2 cups sweet potato puree (divided) Roast about 2 sweet potatoes in a 350 degree oven for 45-60 minutes (until soft) then peel off skin and puree in food processor. In a medium bowl, combine 1 cup of the sweet potato puree, the white of one of the eggs, 1/2 cup of the brown sugar, 1/2 teaspoon of the vanilla, almond flour, and 1/2 teaspoon of the salt. Use an immersion blender to mix well. Place in refrigerator until ready to use. In another medium bowl, combine the two egg yolks, the other cup of the sweet potato puree, another 1/2 teaspoon of vanilla and milk. Whisk until well blended and set aside. In the bowl of a stand mixer, whisk together 3 cups of flour, 1/4 cup of brown sugar, 1/2 teaspoon salt and yeast. Add milk/sweet potato mixture and mix at medium speed using dough hook, about 3 minutes. Slowly add in the butter, a little at a time, while the dough hook is still going. Stop once the dough seems fairly well combined, of not a little sticky. Turn the dough out onto a lightly floured surface and slowly add more flour until you can easily form it into a ball. Place dough in a medium mixing bowl coated with cooking spray. Spray the top of the dough as well. Cover loosely with plastic wrap. Preheat oven to 200 degrees Fahrenheit. After just 5 minutes of preheating, turn off the oven and place the covered bowl with the dough in it inside. Let rise in oven for one hour. After one hour, remove the bowl from the oven and continue to let rise for another hour. Divide the risen dough into two pieces. Roll the first piece into a 10" x 18" rectangle on a lightly floured surface. Use more flour as needed (practicing some restraint) in order to be able to roll the dough out with a rolling pin without it sticking. Spread 1/2 of the marshmallow fluff all over the rectangle, like you would spread tomato sauce on a pizza. Next, spread on half of the sweet potato spread you had chilling in the refrigerator (save for a couple of tablespoons,) and then sprinkle on half of the chopped pecans. Starting at the short end of the rectangle, roll the dough into a cylinder, much like you would for cinnamon rolls. Pinch the seams of the dough together as much as possible. Spread the couple of tablespoons of sweet potato spread that you saved over the top of the cylinder. Then, gently pull up the sides and pinch together at the top of the cylinder, to encase this additional filling. This is where it might get messy, but that's okay. Cut the cylinder in half vertically, then gently braid the two smaller cylinders together. Place in a 9x5-inch loaf pan coated liberally with cooking spray. 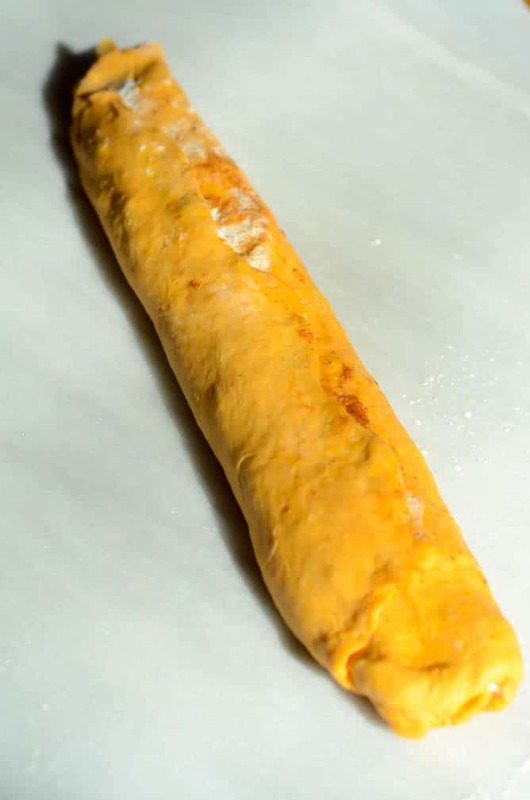 Preheat the oven to 350 degrees Fahrenheit, then repeat the entire process with the other half of the dough. In a small bowl, whisk together the remaining egg and 1 tablespoon of water to make the egg wash. Using a brush, spread liberally over the tops of each loaf. Sprinkle the remaining 2 tablespoons of brown sugar over the tops of each loaf at this time as well. Place loaves in 350 degree oven and bake for about 45 minutes, until the brown sugar top has become nice and golden. Let cool completely before turning out of the pan. 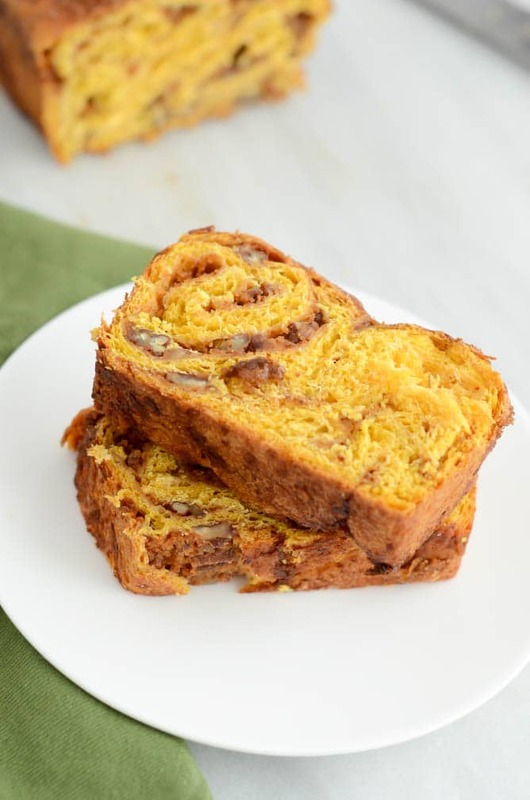 This recipe was adapted from A Brown Table's Sweet Potato Pie Babka. This is going to be the best Thanksgiving breakfast ever!